We’re claiming it, Australia is basically just one gigantic smorgasbord of delectable eats. 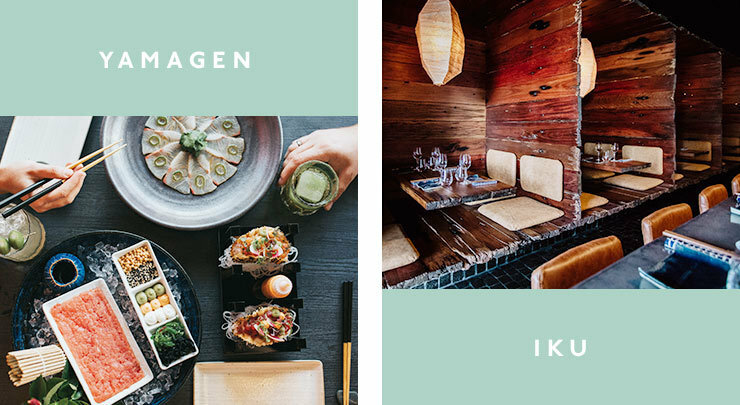 And if 2016 was the pinnacle of fab new restaurants, 2017 was the absolute banger of them all. There’s literally an infinite selection of fresh eateries to wrap your laughing gear around so you’ll want to seriously consider dropping any home-state-bias you have and go HAM with a complete foodie safari around the whole of Oz. Here are the best new Australian restaurants for 2017, so you can enjoy them in 2018 (we’re so good to you guys). We mean, can life get any better when there’s a yakitori and whisky bar in your hood? Answer: probably not. For all the tipple, you can enter through the back entrance which gives you access to a solid list of rare Japanese whiskies, sake and shochu (Aussie spirits are also among the rat pack), but if it’s food you're coming for then you better buckle up (or should that be unbuckle?). If you’re all about juicy, charcoal grilled meats, seafood and a heap of vegetarian and vegan eats you’ve just found your new spot. Tucked away in one of the GC’s fave hotels, word on the street is that Yamagen is the place you should be spending every Friday arvo (washing back all the cocktails you can stomach) and heads up, the chefs here are artsy and experimental AF. No doubt you’ve heard of Donovan Cooke (you know, the legend who brought us Est Est Est, and even though it's been closed for 15 years still cops a thumbs up from anyone that was lucky enough to visit). Expect ginormous high ceilings, chipped paint and a fresh spin on French classics. Dishes at Ryne look something like tuna pizza, smoked duck, Sher wagyu and lamb saddle, plus the whipped cheesecake has worked up a delicious reputation faster than you can say yum. Melbournites are certainly blessed with Kisume and we can confirm every single dish here is literally visual perfection. This gem is all kinds of fancy schmancy redefined, with warm custard and pearl meat, organic somen noodles and roasted cauliflower foam truffle all making an appearance. You’ll find this eatery situated in the heart of Flinders Lane a little lower than street level (it’s basement vibes here) with a handful of super bespoke morsels to try. It’s the sibling restaurant to Restaurant Orana and the baby of Jock Zonfrillo. Bistro Blackwood is the quintessential Aussie bistro that literally goes to town on local produce (but you’ll still find Nonna Mallozzi’s pasta on the menu too). The food line-up here rotates seasonally, but think of delicousness like Australian jerk pork belly and a local-leaning wine list to boot. Open until late, this little neighbourhood bar churns out pizza and 80’s pop tunes so naturally, it’s the place to be (pretty much all of the time). This gem is the combined work of foodie juggernauts Andy Nowell, Rob Denisoff, Josh Dolman and Ashley Wilson so you can obvs rest assured all your booth feasts are going to be seriously good. That includes the cereal milk panna cotta with candied cornflakes and fruitloop. We know. No biggie but New Normal was donned new restaurant of the year (read: if you haven’t been already, hop to it). Food and produce here closely follow the seasons with all goods sourced from Australia’s South West. Located in the iconic Simon Chugg building, you’ll find some seriously delicious nosh and an epic dining room and rooftop terrace to pig out in. It’s all about the carbed-up eats here with garlic and rosemary potatoes and woodfired house-made rye-bread with cultured butter. 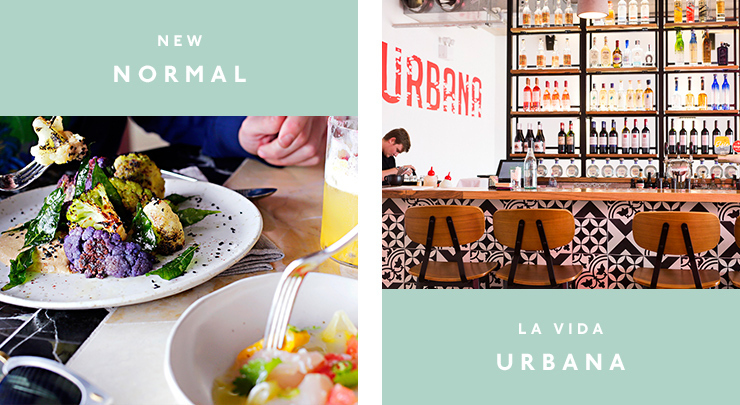 Urban legend has it that after one visit to La Vida Urbana, you’ll no doubt turn into a convert and start preaching about how good it is. Brought to us by the same crew that established El Publico, this Mexican joint is bringing even more eats with super casual feels. And if there’s a nachos done right, it’s the nachos here. Maybe Australia is the new Italy, we don’t know, but what we do know is there’s enough dough on this continent to make pizzas for another eighty generations (or thereabouts) and Canteen Pizza is one of the bloody good legends feeding us the good stuff. You won’t find the usual Euro vibes here, rather the staple, bustlin’ Aussie pavilion feels boasting an eternal summer. We knoowwww this place didn’t open this year BUT it was the only Northern Territory restaurant to score a hat. So that counts. Hanuman has been around since the 90s and they’re serving up delicious Indian food daily. This is where to head for a crazy good (and substantial) feed with a couple of cocktails on the side. Think nautical vibes to a tee. Pier 33 is the newest brainchild from the same team that brought about Rick Shores on the Gold Coast, and just quietly we think there’s no limit on sea views and al fresco dining. The fresh seafood dishes here are made to share with soft shell crab rolls, fish tacos and mussels featuring chilli jam and roti bread all up for grabs. 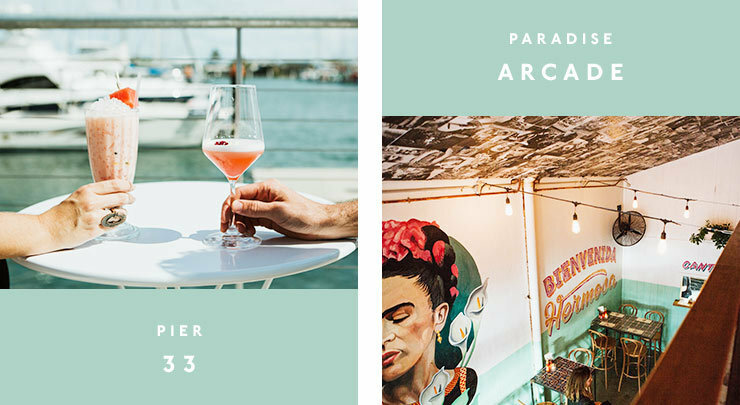 Paradise Arcade is the Cali-Mexican inspired restaurant and cocktail bar offering up all kinds of epic feeds. Basically if you’re a fan of tacos, tequila and hip hop, consider this your new-found local waterhole. With house margaritas on tap (that is no figment of your imagination, you read that correctly—TAP—), and their stand-out char-grilled street corn on a stick, there’s really nothing left to taco ‘bout (except that you need to get here, stat). For a long time this bad boy was tipped to be one of the most fab openings Brissy-town would receive and we can confirm, Honto has lived up to the hype (and more). Brisbane's newest Japanese restaurant and bar means you’re in for a feast like no other. These guys have bunkered down in Fortitude Valley and you’ll be glad to hear that Nathan Lastevec is heading the kitchen (think Longtime people). Three words: double baked souffle. Look, we’d be lying if we said we weren’t overwhelmed with Montrachet’s recent upgrade to Fortitude Valley. 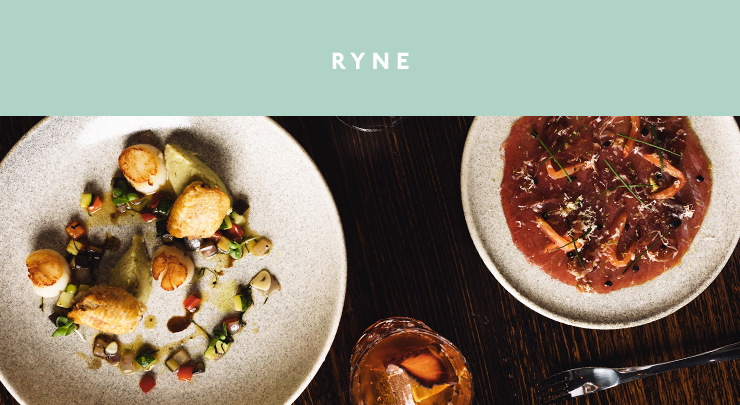 The new site throws up twice as many seats as its previous location and ICYMI, this one hails as one of Brisbane’s most acclaimed restaurants (being a French dining institution and all). Plating up elegance to a tee, you’ll also find lunch options and French desserts to take away should you not feel like soaking up all the glam vibes ever (shame on you). First Melbourne was #blessed and now Sydney is taking the cake (more like chilli salt chicken wings). The south-eastern eats at Chin Chin are everything foodies could dream of and just so you know, the menu feels like an endless list of happiness. Think spiced black pudding sausage, oodles of noodles, stir-fries, curries and its very own cocktail shindig, GoGo onsite. This is no doubt one of the biggest and baddest hospitality drops known to Sydneysiders. 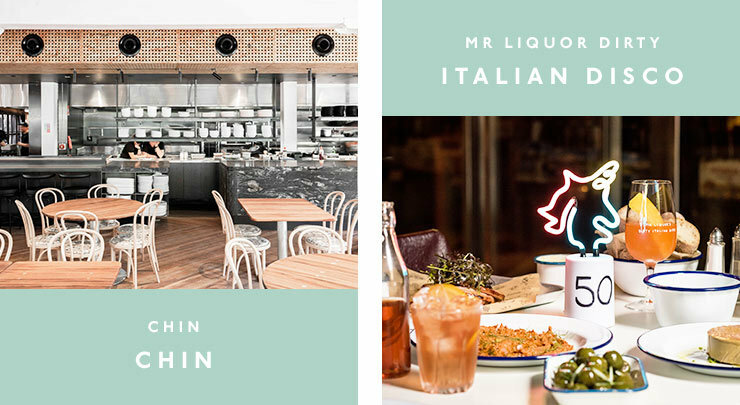 With American-style Italian nosh and disco vibes being the greatest combination known to mankind, you can thank the team at Merivale for giving us this driveway eatery at the Tennyson Hotel. Yep, that means picking up your bevvy from the walk-in fridge, setting up at a table literally on the driveway, then soaking up all the pasta and cocktails to your heart’s content. It’s farmyard feels and all kinds of fresh produce deliciousness at The Agrarian Kitchen Eatery. These guys have pretty close ties with local growers, farmers and fisherman with most dishes undergoing wood-fire, grill and hot-smoker treatment (but you’ll also find a hefty list of tipples and baked goods). Carbs, people. And lots of them. Think, wait for it, Italo-Japanese fare. Right?! That basically translates to dishes of gnocchi made from squid, and roast pigeon with garlic and potato. Yeah, you can’t really call yourself a foodie unless you’ve frequented this epic joint. Fancy a swim after all that eating? Visit Australia's Best Beaches for a cheeky swim.